The Amish population in the state of New York are coming to heads with local tax authorities, as their beliefs clash with new tax filing requirements. In early 2011 the New York Department of Taxation and Finance updated its compliance regulations and made it mandatory for all state sales tax returns to be filed electronically. The new rules are at odds with the local Amish population, who do not believe in the use of electricity or “modern technology”. It is not uncommon for members of the Amish community to provide some services to the general public, or even sell small amounts of produce. As with any other taxpayer, these commercial activities draw a tax liability and a necessity to file annual tax returns. Members of the Amish community have spoken out, saying that they do not object to paying their tax liabilities, but oppose being forced to use e-filing or telephone services. According to several affected Amish taxpayers, they have already sent hand written letters to the Department of Taxation and Finance requesting exemption from the filing requirements. However, trouble arose when the Department wished to speak to the taxpayer via telephone to confirm their requests. So far several members of nearby non-Amish communities have acted as go-between for tax authorities and the Amish taxpayers, but there is concern that the cultural differences will mean that some Amish taxpayers are not adequately represented to tax authorities. Amish taxpayers who have not been able to negotiate permission for paper filing with tax authorities are now reporting that they are receiving letters warning them that incompliance will result in a USD 50 fine. 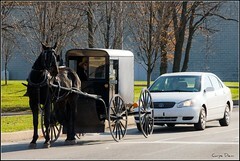 Currently it is estimated that the New York state Amish population is currently at approximately 12 000 people.